According to this friendly but uncompromising manifesto,""being kind"" and""avoiding cruelty"" to animals is not enough. Regan proscribes instead a strict regime of""animal rights,"" forbidding any exploitation of animals whatsoever--for food, clothing, entertainment or even medical research of great benefit to humans. Regan, a leading philosopher in the animal rights movement, intends the book as a popular companion to his scholarly treatments of the subject. 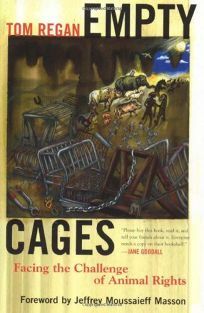 Animal rights activists are, he asserts,""Norman Rockwell Americans,"" not violent zealots, and while he describes a number of animal rights conversion experiences (""nothing else existed, just the elephant's gaze...looking through him""), his target audience is the unpersuaded""muddler"" who needs step-by-step convincing to follow this path. He argues that all animals capable of caring about what happens to them--mammals, birds and (maybe) fish--are""subjects-of-a-life"" and therefore on an equal moral footing with humans. The philosophical underpinnings of Regan's analysis are not overly rigorous, his treatment of counter arguments is sometimes impatient and exasperated, and his sentimentalization of animals (""our culture teaches us not to see hens like Penny and Sweet Pea as distinct individuals"") can seem cloying. The real force of his appeal comes from his exposes of the heinous cruelty meted out to animals in factory farms, mink ranches, hunting preserves, dolphin shows (they're not having fun, they're desperate for fish) and research labs. Outrage sometimes gets the better of him (""is there no limit to the depths of betrayal to which we humans can sink? ""), but many readers will experience equally visceral reactions.